Last minute decision to embark on a food tour to Penang. 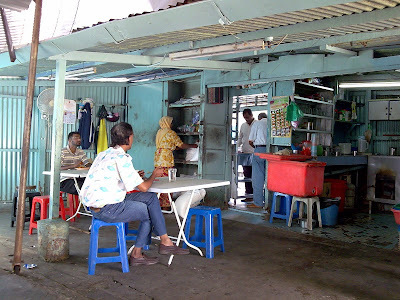 Arriving pretty late for a breakfast, we went for one anyway, as Ms MayI was waiting with bated breath for our arrival, expecting us to bring her around to ‘makan’, instead of her (being a Penangite herself) bringing us. Hmm, where to go? Either dim sum at Anson Road, or roti telur at Argyll Road. As me and Material Boy were feeling mighty full from our breakfast @ home, we opted for the latter. We were wondering if the stall was still operating at that hour (roughly 11+ am), as the crowd goes for breakfast mostly. 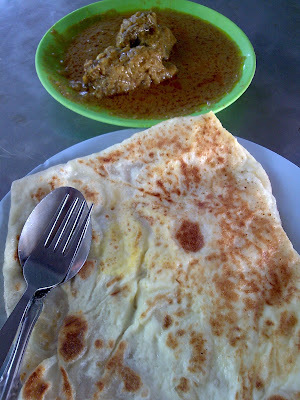 We were in luck, and I ordered my favourite Roti Telur, but forgot which was the delicious curry I had last time. 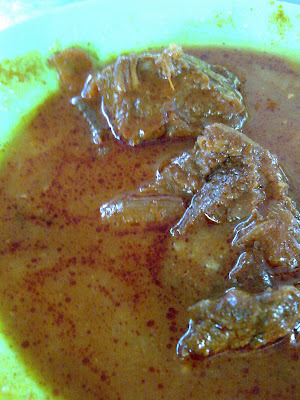 Simply picked ‘kari kambing’ (mutton curry) while Material Boy and MayI shared another with ‘kari daging’ (beef curry). We forgot she neither eats beef nor mutton though, forcing her to taste the gravy only. Hehe …. Tastewise? Same old quality serving. And the portion is still pretty big. The difference between their roti telur and the others served by various mamak stall is that theirs is stuffed with plentiful of egg, yolks, whites and all, and the roti canai used in wrapping the egg is thin, and nicely done. The mutton meat is soft, not chewy, and lack the typical gamey taste of mutton. However, slight complaint is that only TWO chunks of meat were served, and it did not come cheap either, costing RM6.50 (!) for my share. Only when Material Boy got his roti telur and beef curry (RM3.70), did I realize that THIS is the common popular choice here,not my mutton curry. Flavourful, spicy, and soft, the meat is aromatic, and marinated very well, the flavour of the spices and curry sipping into the meat thoroughly. The last time I had these, they served 2 HUGE chunks of beef, complete with bones and all, but this time around, the portion shrunk to 2 smaller chunks. Inflation probably? 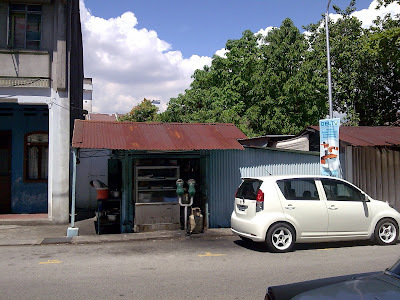 Location : Argyll Road, opposite Utusan Malaysia office. Specifically, on Jalan Burma (coming from KOMTAR side, using Jalan Penang), turn right into Jalan Transfer. Go straight until nearly the end, you’ll notice Jalan Argyll cutting across the road. On your right you will see a petrol station on Jalan Argyll (Esso, I think). The stall is on the same side with the station, but the road is a one-way street, meaning you can’t turn right into the station. Thus, either park on the left side of Jalan Argyll, or make a round and enter from the right end of Jalan Argyll. hey! i see we’re doing penang review this month! :). 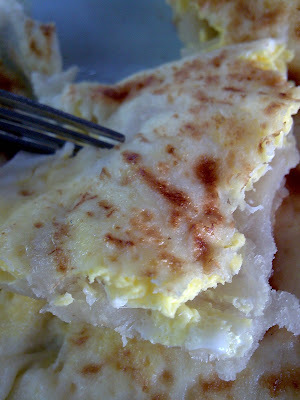 when it comes to roti canai, i find the kelantan and terrenganu versions the nicest..lovely lovely..